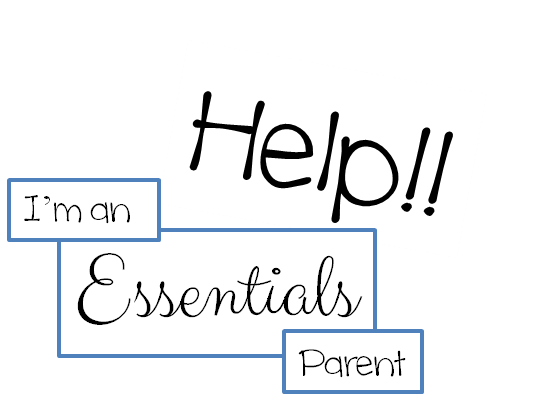 HELP I’m an Essentials Parent! Sign up for Essentials they said…it will be fun they said…. Ever feel like you just don’t know what you’re doing? Or you’re just so overwhelmed with life that the thought of helping your child with another paper is just too much? That’s how many moms and students feel in Essentials and I’m here to tell you that you don’t have to feel that way! Huh? There’s MATH in our English Class??? First let me clear up the misconception that Essentials is a “Language Arts Program.” The problem with saying that then we get asked the question, “Why do we do math in a Language Arts class?” Well the answer is because it’s NOT a Language Arts class! Ask Leigh Bortins and she’ll tell you…. (I know because I’ve asked her!)…. 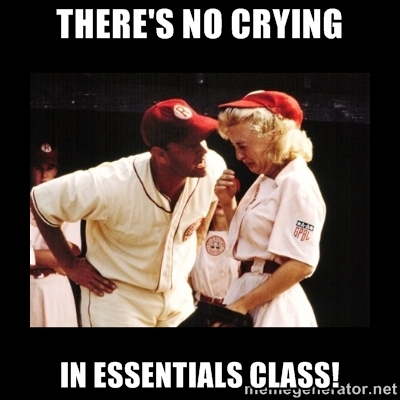 that Essentials is really a class of “essential” skills needed before moving into Challenge! Well! That makes perfect sense since the name is ESSENTIALS! When Leigh went back to create Foundations and Essentials, which was after she had created Challenge, she tried to think of the basic essential skills that all kids would need in order to be successful in Challenge. 3 Things! These three things will give your child the ability to take on the rigorous Latin assignments (yes…it’s hard), be able to write persuasive essays (yes…they write papers a lot!!! ), and be able to handle Algebra without it taking years to get one assignment done! Okay, so now that we’ve cleared that up, let’s take a look at Essentials an why so many people feel overwhelmed. Use the program as it was designed. You see, most of us are used to text books. You open the book at the beginning of the year, you work through ALL the assignments, close the book at the end. You’re expected to know it all, learn it all, and be tested on it all. That is not the Classical Model. The EEL Guide is designed to be learned in layers. These layers (or years) also follow the Trivium. In my class, I explain to the moms that their first year through is actually the most fun! It’s the easiest! Yep..you read that right! If you are crying and feeling like a failure, then you’re doing something WRONG! So how do layers work? Well, I would suggest that every Essentials mom read the beginning of the EEL Guide! It is loaded with information about this! But basically here it how it works…. The first year is basically like the “grammar” stage of grammar (this goes for the IEW writing too). The focus this year is to learn the terms, charts, structure, and format of the EEL and IEW books. Spend your time at home memorizing the charts! It’s so important. 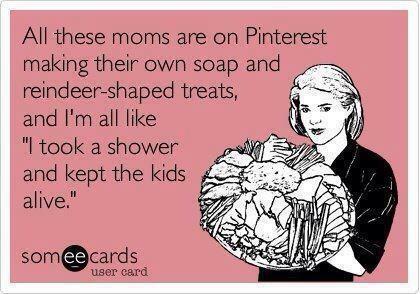 I know that many times moms look at those charts and get overwhelmed, but you don’t have to be! Break up the charts into sections to learn. I always start with the definition of the part of speech, and then I concentrate on the bold items on the chart. Only when that is mastered will I then have my child work on the rest. This process shouldn’t be avoided! Make it fun. Use all those great ideas you see tutors use in Foundations! Make up chants, hand motions, songs, draw, etc….whatever works! You can also find lots of songs and chants on YouTube! When it comes to the Task Sheets and actually DOING the Grammar, keep in mind again that it’s a 3 year program. Stick with the “Basic” sentences from each week (those are the first 3 sentences) and don’t worry about the “Advanced” ones yet. However, if you are a 2nd or 3rd year family, then you should do those. A 3rd year student should also be completing Task 6 (Quid et Quo) and even adding modifiers to their Task 5 sentences! In class don’t allow what’s being discussed to scare you. The tutor is going to present the material to a mixed level class, so she/he has to cover some advanced concepts. That doesn’t mean you need to learn it all. Pick the simplest concepts and learn those first!! I know it’s hard, but just accept that you won’t necessarily understand it all as it’s being taught the first time! Have your EEL Guide out while in class and take some notes in the margin for later. On that note, when you, as a mom, get an epiphany about some mystical grammar concepts that you know finally understand, it doesn’t mean you have to make your child understand it! What does that mean? Well, remember when I said the 3 years follow the Trivium? If your child is still in their first (or maybe even 2nd) year, they are still building their grammar level skills (setting up their foundation). You on the other hand, are more advanced. You’ve been through school, you’ve had to write papers, so you are hearing these concepts again. As you hear them again, you’re creating layers in your brain, and things may click for you much sooner than your child. Many moms then get so excited that they want to immediately turn to their child and try to get them to understand it too. I know you’re just so excited that something confusing finally makes sense to you, but your child may not be ready for it to click yet! Let them build their foundation first then later they will start clicking too! Trying to force a “grammar stage” child to have “dialectic” discussions only creates tears and frustration! So, let them see your excitement and look forward to the day when it clicks for them!! Seeing you participating and learning is a wonderful model for them to follow! Okay…so what does it look like at home? First it’s helps if you’ve set up an Essentials Notebook with dividers that match the different tasks/steps in Essentials. By setting up a separate notebook for Essentials, it creates an easy-to-use outline for your daily work. Each day your child will open their notebook and work through the tabs. First tab is charts. They follow the schedule and practice their charts (on paper, out loud, etc). Then they turn to the next tab: Task Sheets. They follow the schedule and complete their sentence for the day. The next tab is Editing. Here you child will edit a selection from the EEL Guide’s editing sheets or whatever you might be using. The next tab is IEW. Here is where your child will work on their rough draft. Finally, the last tab is Vocabulary. This is where they store all their vocabulary cards from the IEW book along with their vocabulary quizzes. When they are done with the last tab, they have completed all they need to do for the day in Essentials. It’s that easy! 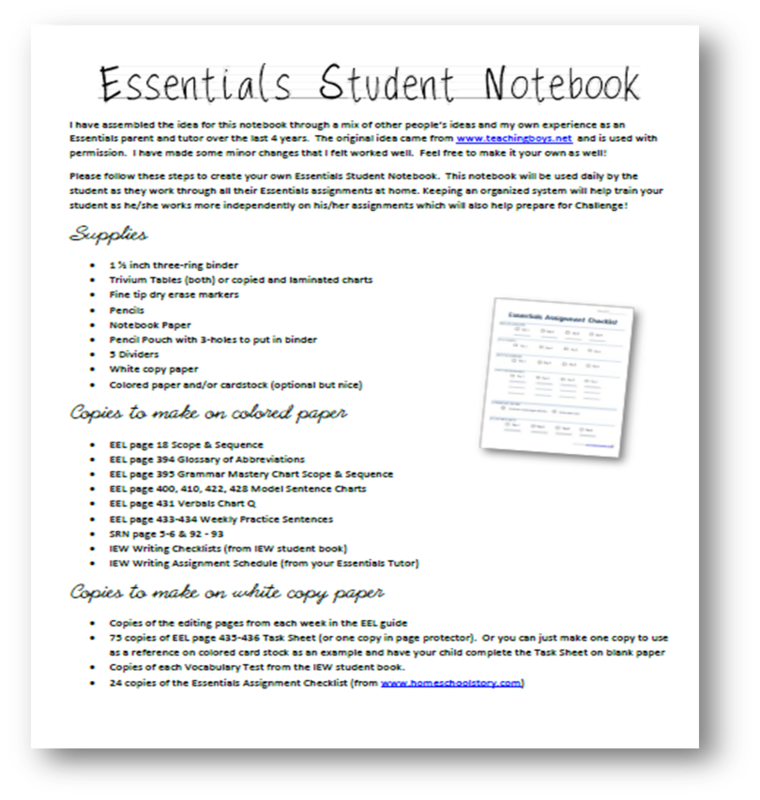 The directions for putting together a notebook as I’ve suggested is available as part of my Essentials Packet. Another helpful printout is the Daily Checklist. This is also part of my Essentials Packet. Basically this is placed FIRST in their binder before any of the tabs. You can write in details like exactly how you are breaking up their writing assignment (day 1-finish KWO, day 2-brainstorming, day 3-rough draft, day 4-final draft). It won’t always be the same every week since some units will require a different approach, but you get the idea. Also you are able to write in which charts to work on each day. This helps if you are scaling back for a first year student and focusing on the basic charts rather than following what’s in the guide all the time. There is also a place to schedule math facts. This is always the next question. I always say that you should spend about 20 minutes on charts, about 10 minutes on Task Sheets, and 10 minutes on editing. That’s about 40 minutes on grammar. IEW is a little different since it depends on the unit, the length of the assignment and how much was done in class. But basically I spend about 20-30 min. a day on writing. So basically about 1 hour a day for everything. You can break it up into smaller chunks if that helps. Writing first, then maybe history, then come back to grammar. 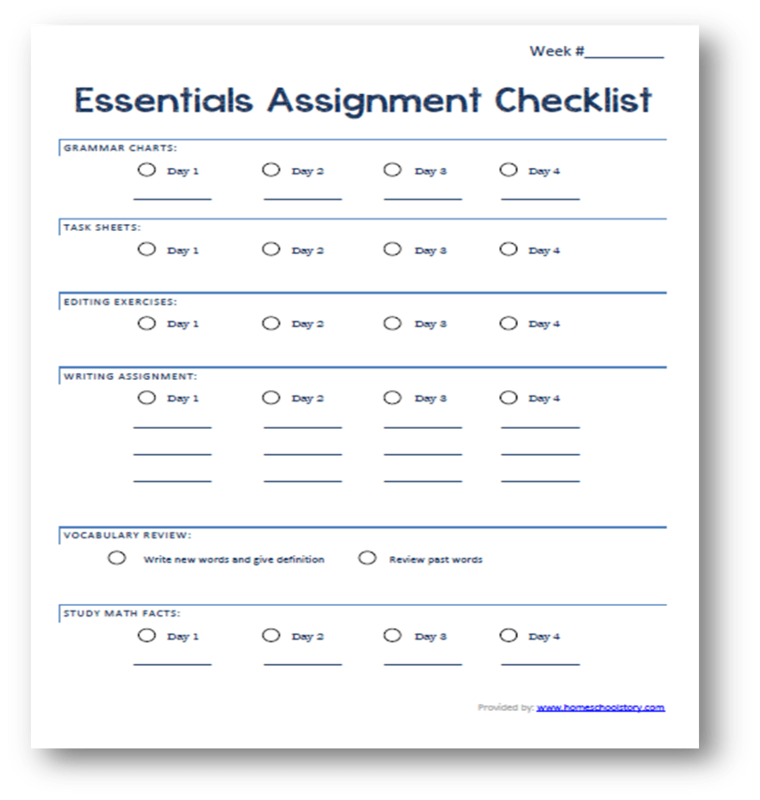 Over the years in Essentials as a parent and tutor, I’ve created some helpful resources that I’d like to share with you! 3. Grammar Guru Memory Board (1st & 2nd Semester) – a printable checklist that looks like a game board. Use this keep track of the most important skills and memory work for any EEL student. A great assessment or goal keeper. 4. Grammar Quizzes – a more traditional format to use to assess your child as they progress through the year. 4 quizzes included. 5. Fused Outline Form – this is used for research papers and Faces of History. This is also an excellent resource for Challenge A students to use for their weekly science papers. 6. Introduction Outline & Checklist – used generally with research papers and Faces of History, this outline helps students follow the IEW steps to creating an Introduction. 7. Conclusion Outline & Checklist – used generally with research papers and Faces of History, this outline helps students follow the IEW steps to creating a conclusion paragraph. Wow! This is fantastic guidance for a first year momma like me!!! Will you have this updated for Cycle 2??!! Hi Allison, yes the download contains the Cycle 2 Faces of History suggestions. All other items are the same for every cycle. I purchased and downloaded your Essentials packet from last year. Is there a way to get ONLY the Faces of History part for this year? Sure! I’ll email it to you! Thank you for your hard work on this. I just printed the material and putting it all together now. I do not know what the “IEW lesson checklist from the student book for the lessons to be completed this year” Is or where to find it. Can you assist me on this? Thank you. Will this work for cycle 3? Hi Angela! Yes the Foundations of a Classical Education planner as well as the Grammar & Writing kit will work for all the cycles! !